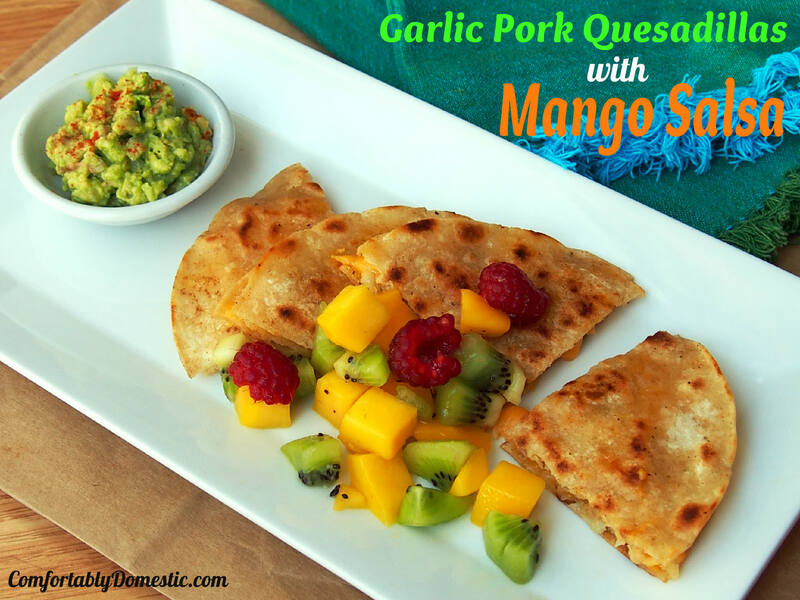 Garlic Pork Quesadillas with Mango Salsa are any easy dinner that you can make using leftovers! We try to commit to eating at home as much as possible. Home cooking is just better for our bodies, and easier on the wallet. My secret of how to cook from scratch every night without going insane is simple: I try to cook meals that can be reworked into at least one other dish whenever possible. 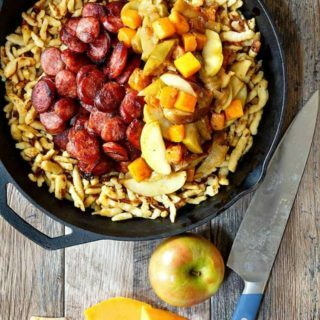 I don’t know about you, but in this house, meals that elicit cheers one night are often met with either a stunning silence or groans the next. Leftovers fall completely flat around here. However, if I change the presentation–even if only slightly–then the rave reviews return. My men are fickle like that. But I love them just the same. So the night after serving Garlic Pork Roast, I remixed the leftovers into Garlic Pork Quesadillas with Mango Salsa…and the crowd went wild! Garlic Pork Quesadillas use the remains of the tender pork and caramelized onions from the night before. 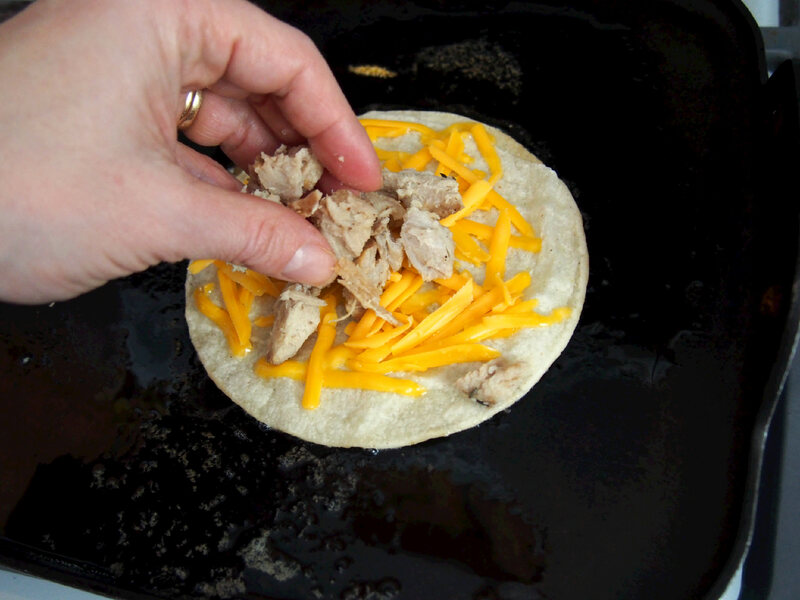 The pork is sandwiched between two corn tortillas, and glued together with copious amounts of gooey, melted cheddar cheese. When topped with a sweet Mango Salsa, these pork quesadillas taste more like exciting party food than boring leftovers. 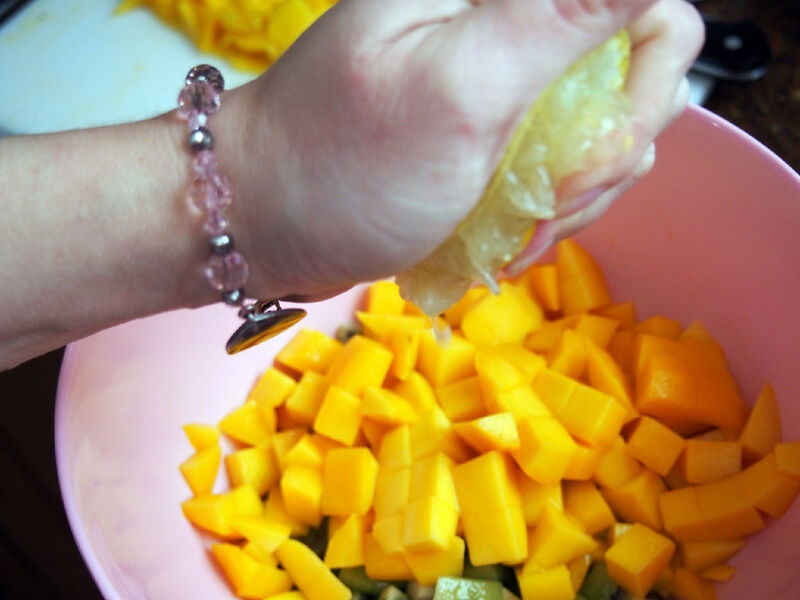 Let’s get this party started by making the mango salsa. Grab a couple of ripe mangoes, several ripe kiwi fruits, a hefty handful of red raspberries, a little lemon juice, a pinch of kosher salt, and a few chopped sprigs of cilantro. 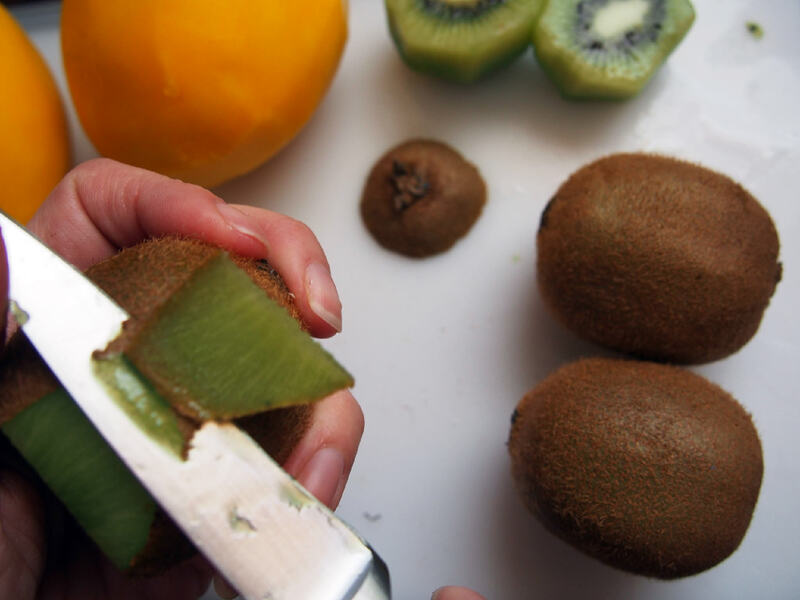 Now, I don’t like to brag, but I believe that I know the best way to peel a kiwi fruit. Since I spent a good portion of my teen years preparing fruit at the frozen yogurt shop that I worked for, I consider myself to be a kind of Fruit Peeling Savant. True story! 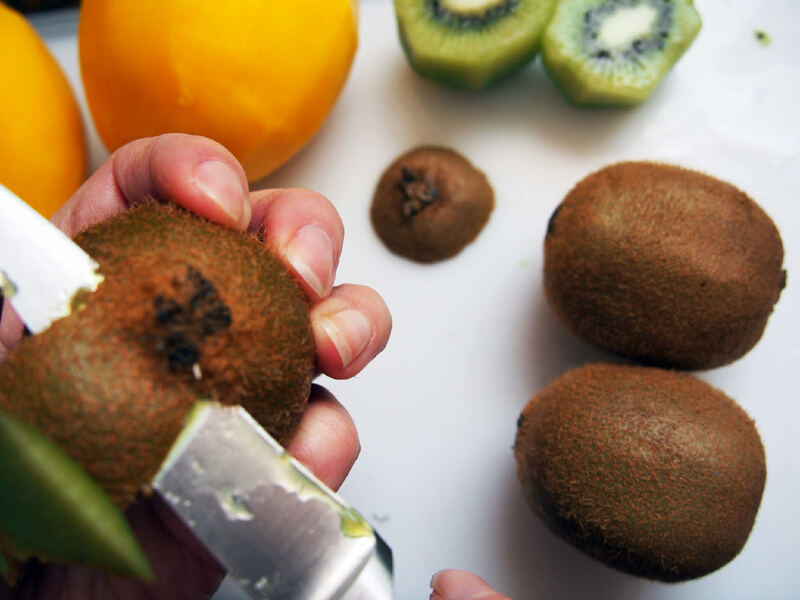 Start by running a paring knife around the top portion of the stem side of the kiwi–that’s the side looks like it has a belly button with a tuft of fur poking out of it. It’s a known fact that kiwi is one of the least glamorous looking fruits around. ‘sure are tasty, though! until you reach the bottom. 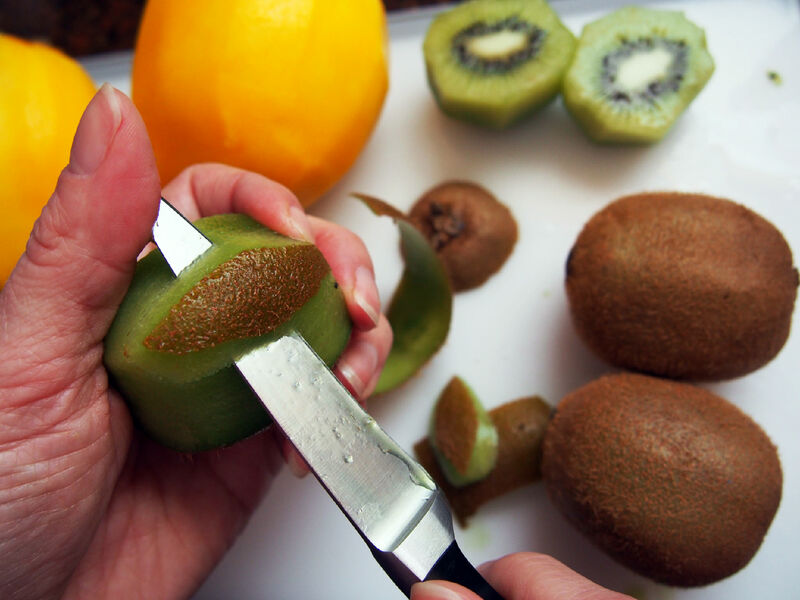 Keep turning the fruit as you cut, until a long “U” shape of skin has been cut off. If the thought of cutting something in your bare hands makes you a bit squeamish, then this can also be done on the cutting board. I’ll trust you to know your own knife skills. From there, continue cutting the skin away from the fruit until it has been completely peeled. See how easy that was? 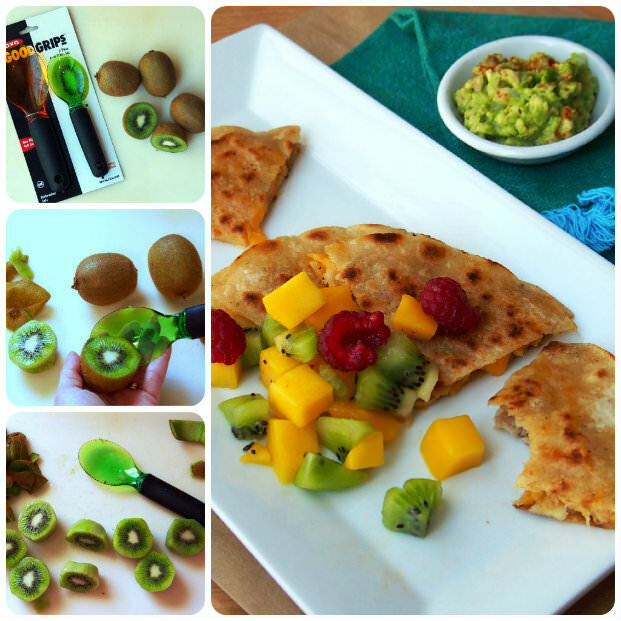 I thought for sure that I had the best kiwi peeling method around…that is until my Friends at OXO sent me their Fruit Scoops. 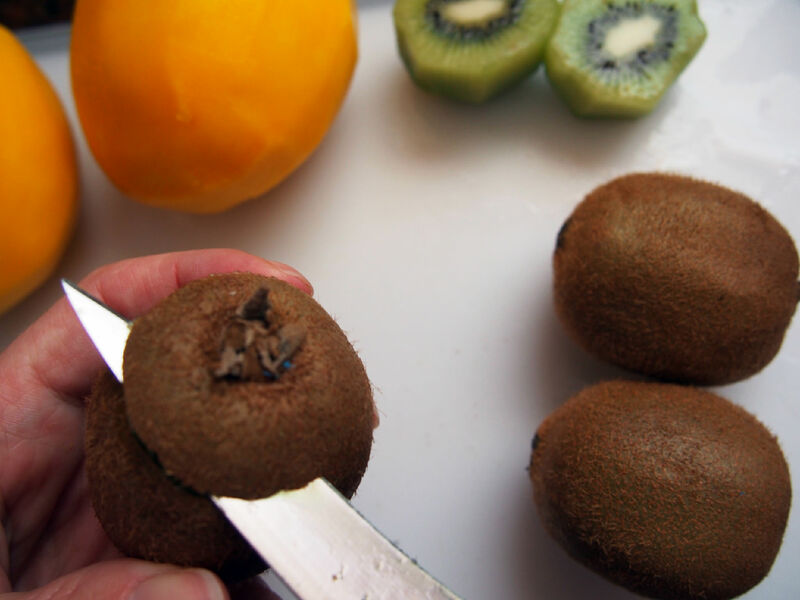 With those handy tools, all I had to do to peel the kiwi was to cut it in half and scoop out the fruit, which was infinitely easier. After nursing my bruised ego, I diced the peeled kiwi and added it to a big bowl. 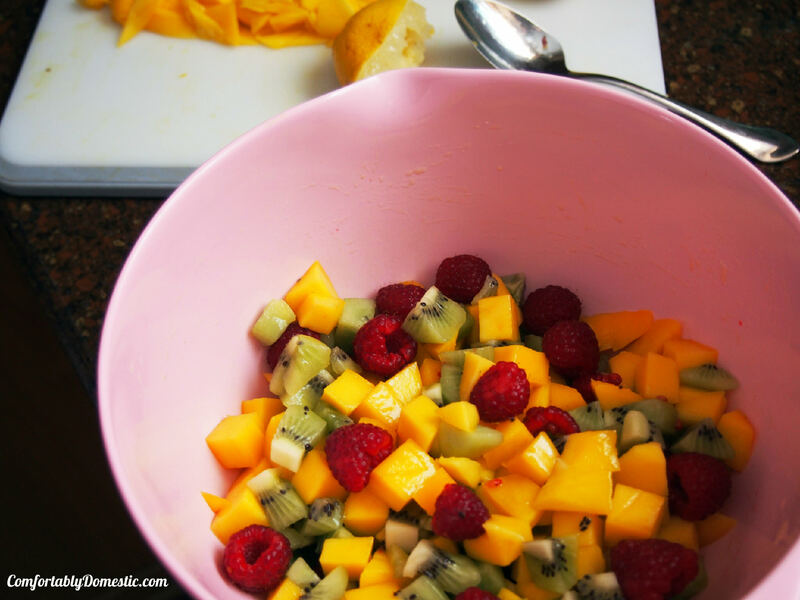 Then I peeled the mango, cut the fruit away from the fibrous core, diced the fruit, and added that to the bowl of kiwi. OXO also makes a fabulous mango splitter that, along with the fruit scoops, makes short work of this process. As my sweet boys have a habit of rearranging my kitchen drawers every time they put the dishes away, I just couldn’t find mine at the time. 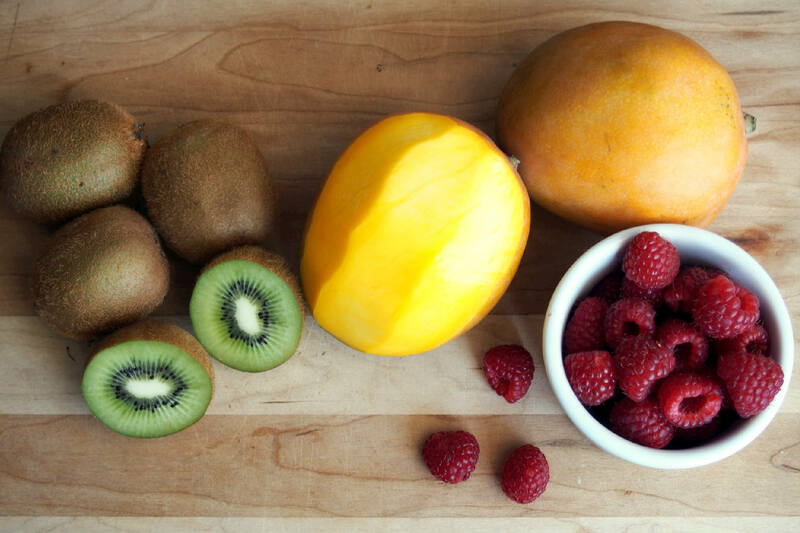 Squeeze a little fresh lemon juice over the fruit before adding the raspberries to the bowl. Sprinkle in the salt and chopped cilantro before giving the salsa a gentle stir to combine. Since Bacon Slayer makes a face akin to Bill the Cat whenever cilantro is involved, I leave it out of the big bowl, opting instead to sprinkle it over my portion later. Cover the salsa and refrigerated it while preparing the quesadillas. To assemble the pork quesadillas, chop or shred the leftover garlic pork, shred a whole mess o’ cheddar cheese, and grab a stack of corn tortillas. As always, please freshly grate your cheese. It’s just the right thing to do. Melt a pat of butter until it sizzles on a hot griddle set over medium-high heat. 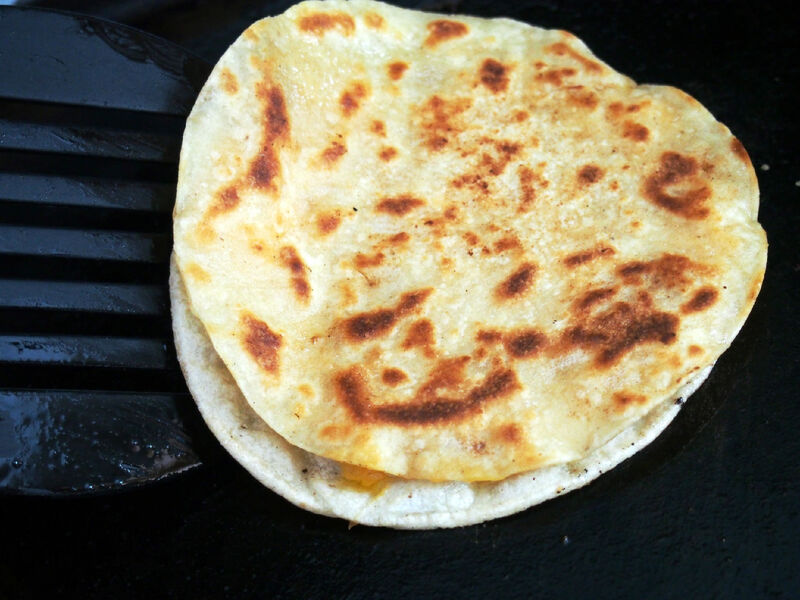 Begin the quesadilla layering process by placing a tortilla on the hot butter, sprinkling it with cheese, adding a healthy layer of chopped pork, more cheese, and a second tortilla. Cook the quesadilla for a couple of minutes, until the cheese on the bottom has melted, and the bottom tortilla is very brown and crisp. Carefully flip the quesadilla, and continue cooking the other side until it is also brown and crisp. Repeat the process until all of the quesadillas have been made. 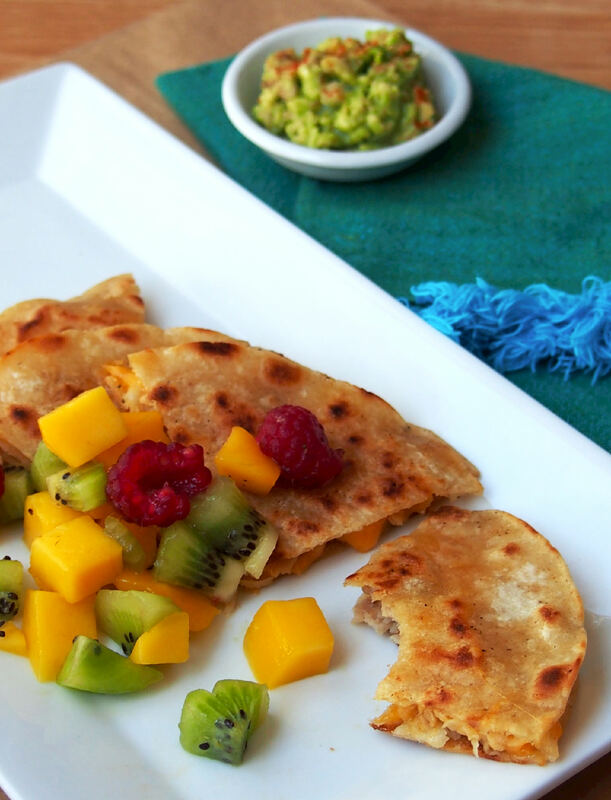 Garlic Pork Quesadillas with Mango Salsa is a great way to breathe new life into leftovers. 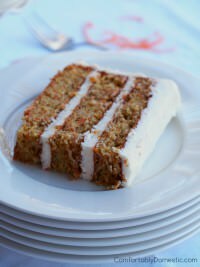 Serve them piping hot of the griddle, and get ready to be showered with cheers and accolades. Of course, offering up a side of guacamole just adds to the overall excitement of the dish. Hope you will love these pork quesadillas! A reconfiguration of leftover Garlic Pork Roast, brightened up with fresh mango salsa to help breathe some excitement back into leftovers. 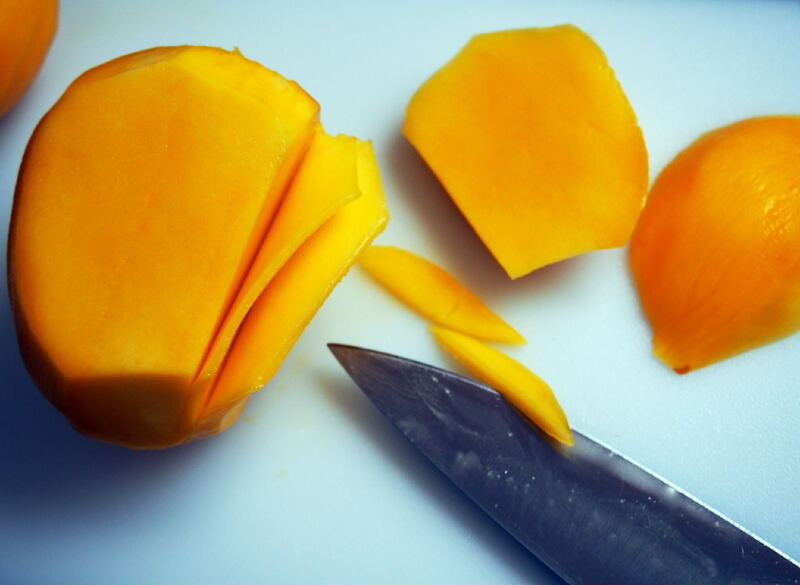 Peel the mangoes and slice the ripe fruit away from the fibrous core. Dice the mango and set in into a medium bowl. Peel and dice the kiwi fruit, adding to the mango pieces. Add the raspberries to the bowl, along with a pinch of Kosher salt and the cilantro (if using.) Squeeze the lemon juice over the fruit, and then gently stir to combine. Cover and refrigerate the the fruit salsa while assembling the quesadillas. 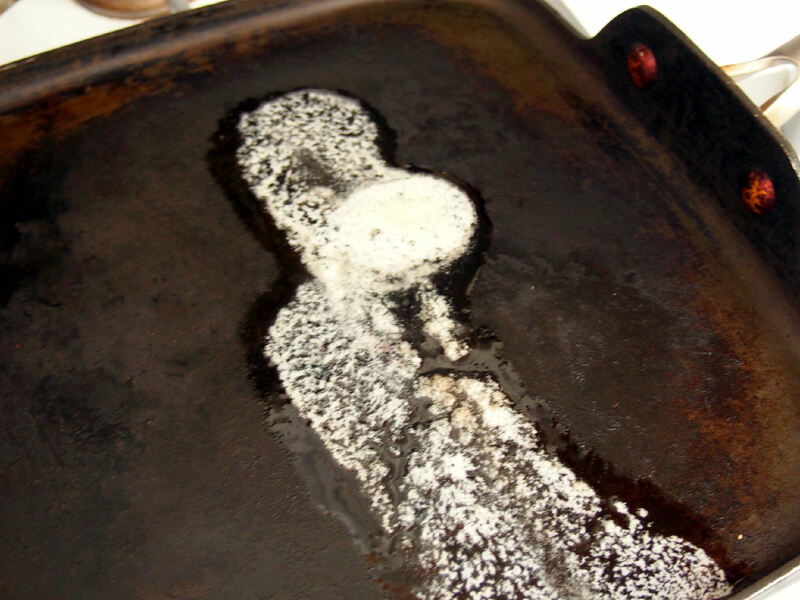 Melt one quarter of the butter on a hot griddle set over medium-high heat. Place one tortilla on the butter, sprinkle a small amount of cheese on it. 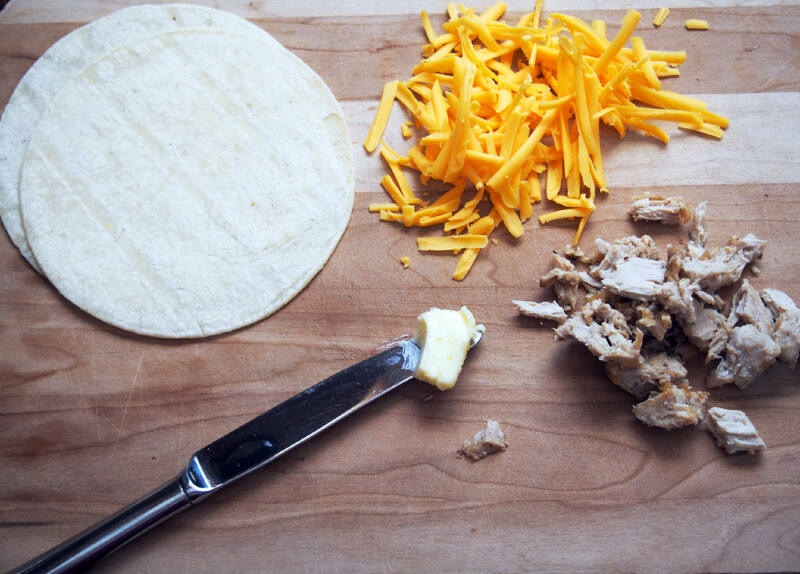 Place ½ cup of the shredded pork roast on the tortilla, top with a little more cheese (¼ cup total,) and another tortilla. Cook for 2 to 3 minutes, or until the bottom tortilla has browned and cheese begins to melt. Carefully flip the quesadilla over to brown the other side. Repeat with the remaining butter, tortillas, cheese and pork roast. 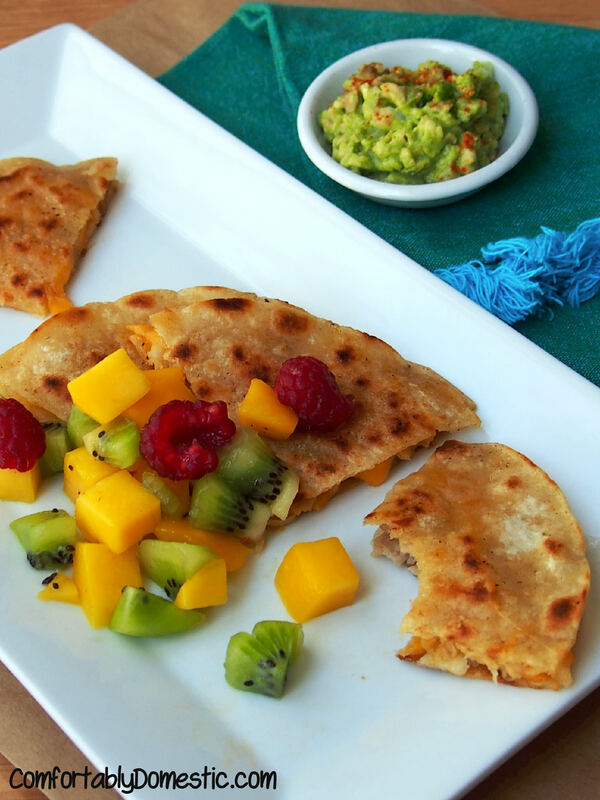 Serve hot quesadilla cut into quarters, with a spoonful of the mango salsa over top.